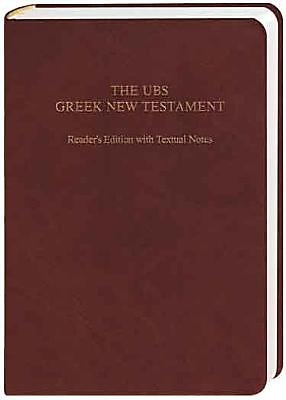 Features the Bible text of the latest edition of the UBS4 Greek New Testament, edited by Barbara Aland, et. al., and the running on-page Greek-English Dictionary, compiled by Barclay M. Newman. In addition, it also features textual notes compiled by Florian Voss that provide an overview of the most important differences between major Greek manuscripts. Other important features include 1) Translation of all vocabulary items occurring 30 times or less in the New Testament at the bottom of each page 2) Definitions of idiomatic word combinations 3) Parsing of all difficult verb forms 4) Reader-friendly layout enabling the reader to transfer easily from text to dictionary and vice versa 5) Appendix providing all vocabulary items occurring more than 30 times in the New Testament 6) Maps from the UBS Greek New Testament 6) Old Testament references in the margin.